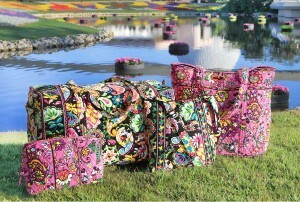 As the Disney Collection by Vera Bradley is unique to Disney Parks, fans will not be able to purchase bags from the collection at any Vera Bradley store – they are only available to disney Parks or the Disney Parks online store. And, there’s a new color collection coming soon to the World of Disney Store at Downtown Disney. It’s called “Where’s Mickey?” and features a green and blue color palette. The “Where’s Mickey?” color will be available on styles including the hipster, backpack, large duffel, and more. This color will eventually be available at select Disneyland Resort stores and on the Disney Parks online store.